Condensing assembly and an operator control unit was sent to the Viru Keemia Grupp (Estonia) from IPEC production site. This was the second batch of the equipment for the waste slate sludge management project. 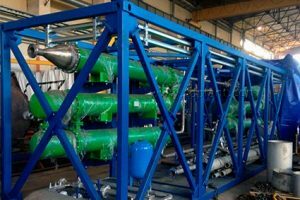 The condensing assembly will serve two TDP-2-2000 pyrolysis plants, one of which has already been shipped to the Customer. Modified screw system of the reactor will provide more efficient raw materials sorting thus increasing the production capacity of the TDP plant up to 4400 lb/h. TDP-2-2000 is certified by TÜV NORD, which enables IPEC to enter the European market directly and start deliveries as early as 2017.